Wario's Treasures are Wario's collection of valuable objects in various Wario games. In most games, Wario steals the treasures from various places. In Wario Land, Wario hears of great pirate treasure found on Kitchen Island. Wario braves the island and single-handedly defeats Captain Syrup and her pirates and escapes with their loot. Based on how much loot he has, Wario gets a bigger piece of land. Captain Syrup steals Wario's Treasure in Wario Land II. Wario chases the pirates to get his riches back, which he eventually does after doing away with the pirate crew once and for all. Additionally, 50 hidden treasures can be obtained throughout the 50 levels of the game, by playing a mini-game called Matching Game. A treasure map can also be unlocked by playing and winning a Number Matching Game at the end of every level. Together they give access to the secret Time Attack mode and the mini-game Flagman D-D to the player. When Wario was in the Music Box World, a mysterious figure told him he could keep all the treasure of the world if he freed the figure. After collecting all 100 treasures, Wario freed the figure, only to discover it was evil. After defeating him and freeing the villagers, Wario gets to keep all the treasure. In Wario Land 4, Wario loots an ancient pyramid and steals all of its treasures. He later defeats the pyramid ruler, the Golden Diva, freeing the legendary Princess Shokora. In Wario World, the black jewel transforms Wario's treasures into monsters. Wario must get his treasure back. 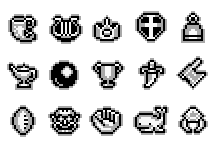 Each of the game's eight levels has eight treasures to collect, for a total of 64 in the game. To find a Treasure, Wario must find and activate a button. The buttons are color-coded and when one is activated, its corresponding treasure chest appears on a colored platform somewhere else in the level. Wario can then open the chest and collect one of his missing treasures. If Wario comes across a treasure chest platform before activating the platform's button, he will be unable to receive the treasure. For this reason, backtracking is sometimes necessary. Along with helpful items such as maps to the current location, Guise Gems and keys to important doors, treasure chests also contain treaures that boost Wario's money tally for the current level. The player will have to complete one of several mini-games in order to obtain the treasure, which get harder on later levels. Once Wario obtained a treasure, he can view it, its value, and a description of it in his Treasure Log on the main menu. Starting in the third level, Treasure Pest enemies appear and randomly replace one of these treasures in every level; Wario will have to retry the level later in order to get the treasure. Also, on return trips, Wario can re-open chests that contained Guise or Mastery Gems in order to get a new treasure. This page was last edited on April 24, 2019, at 15:10.